If you’re on the market for new home cinema gear, the IFA 2018 isn’t disappointing. The Berlin event is always a great stop for AV equipment, and Harman Kardon is pulling out the stops this year with its new Enchant soundbar range. 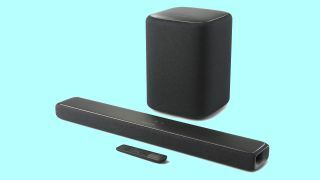 Offering “high-quality sound without compromising on space or design,” it’s packing the company’s proprietary MultiBeam technology, which uses a digital signal processor alongside the soundbar’s side firing transducers to bounce audio off the walls for a surround sound experience. It removes the hassle of a wired surround sound system, which delivers true surround sound from discrete speakers in favor of a single box. To achieve this, it uses what Harman Kardon is calling an Automatic MultiBeam Calibration system to map the dimensions of your room and match the bouncing audio pattern appropriately. The Enchant soundbars will be available in two different sizes. The 1300 will measure in at 44 x 2.6 x 4.9 inches, and uses 13 channels to deliver a max output of 240W. It has Wi-Fi and Bluetooth with three HDMI inputs, and costs £899.99 (about $1,160 / AU$1,580). As you could guess, the 800 has 8 channels of sound with 180W output. It’s smaller at 33.8 x 2.6 x 4.9 inches, and also has Wi-Fi and Bluetooth, but just the one HDMI input. It costs £619.99 (about $800 / AU$ 1,090). There’s also a wireless subwoofer to accompany the range, with 400W output for £619.99 again. Regardless of which model you go for, Chromecast is built into each of the Enchant soundbars, letting you stream shows from your mobile device or PC to your living room, and also allowing the soundbars to become part of a Chromecast multi-room audio system. The Harman Kardon Enchant range will be available before the end of the year.